This letter from A.O. 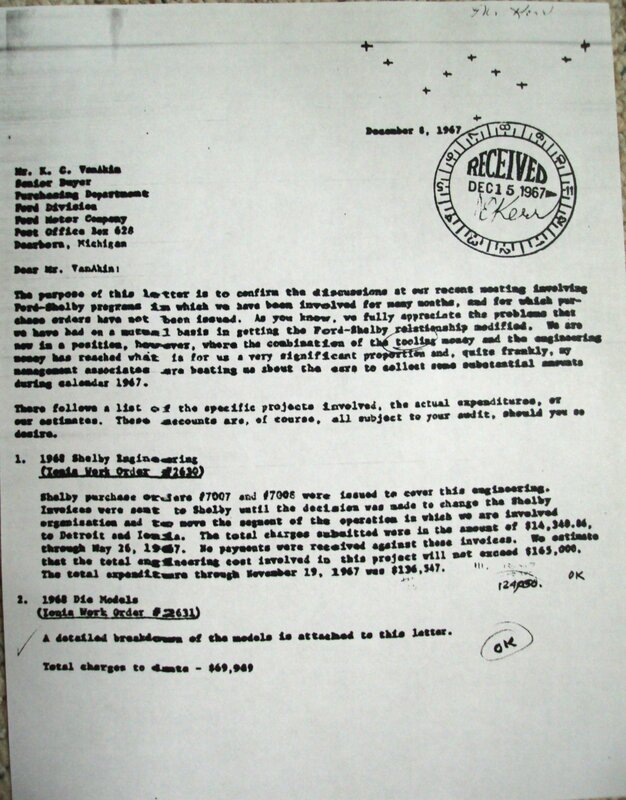 Smith is addressed to Ken VanAkin, Senior Buyer - Purchasing Department at Ford Motor Company, and references some of the worked performed for Shelby American and Ford Motor Company in relation to the Shelby Mustang program during calendar year 1967. No vehicles are directly referenced by VIN or inventory number. The contents or this letter have been retyped for easier reading and our analysis has been added below. The Purpose of the letter is to confirm the discussions at our recent meeting involving Ford-Shelby programs in which we have been involved for many months, and for which purchase orders have not been issued. As you know, we fully appreciate the problems that we have had on a mutual basis in getting the Ford-Shelby relationship modified. We are now in a position, however, where the combination of the tooling money and the engineering money has reached what is for us a very significant proportion and, quite frankly, my management associates are beating me up about the ____ to collect some substantial amounts during calendar year 1967. There follows a list of the specific projects involved, the actual expenditures, or our estimates. These accounts are, of course, all subject to your audit, should you so desire. Shelby purchase orders #7007 and #7008 were issued to cover this engineering. 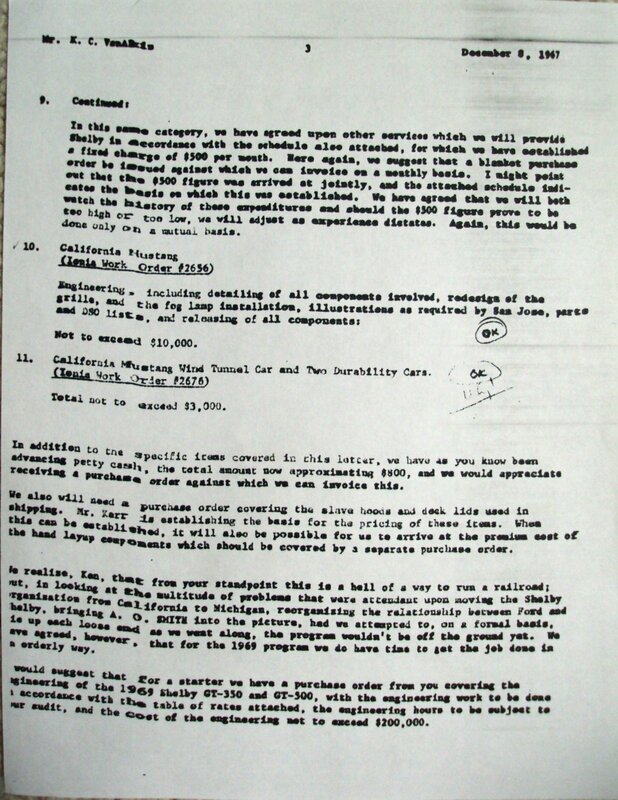 Invoices were sent to Shelby until the decision was made to change the Shelby organization and to move the segment of the operation in which we are involved to Detroit and Ionia. The total charges submitted were in the amount of $14,340.86, through May 26, 1967. No payments were received against these invoices. We estimate that the total engineering cost involved in this project will not exceed $165,000. The total expenditure through November 19, 1967 was $136,347. A detailed breakdown of the models is attached to this letter. 3. Engineering Assistance during 1967 Shelby Program, including paint and finishing technician's time in California and the engineering requirements involved in the emergency fabrication of components for the 1967 Shelby. 4. Prototype Components for 1968 Photographic Cars. Temporary tools were made and prototype parts shipped to California to modify two cars for photographic purposes. Included with these shipments were two sets of hoods, front ends, rear lower panels, and consoles. A significant amount of premium time was involved. This purchase order was originally written on a not-to-exceed-$7500 basis. Content of the job, however, increased significantly, and the actual charges total $10,480. Total charge against this job - $3780. 7. One convertible and one fastback returned from Dearborn Steel Tubing converted to 1968 configuration. One car modified for wind tunnel use. Total charges against these six cars were $12,725. Of this, $5,000 was regular production supervision. We are deducing the $5,000 on the basis that the cars served a partial pilot function. Actual amount to be invoiced . . . $7,725. 9. Drafting and reproduction services are being provided in accordance with an agreed-upon schedule of charges. I am attaching copies of this schedule for your reference. We would suggest that a purchase order be set up for one year against which we will invoice on a monthly basis. Total charges to date - $518. In this same category, we have agreed upon other services which we will provide Shelby in accordance with the schedule also attached, for which we have established a fixed charge of $500 per month. Here again, we suggest that a blanket purchase order be issued against which we can invoice on a monthly basis. I might point out that the $500 figure was arrived at jointly, and the attached schedule indicates the basis on which this was established. We have agreed that we will both watch the history of these expenditures and should the $500 figure prove to be too high or too low, we will adjust as experience dictates. Again, this would be done only on a mutual basis. Engineering - including detailing of all components involved, redesign of the grille, and the fog lamp installation, illustrations as required by San Jose, parts and DSO lists, and releasing of all components. In addition to the specific items covered in this letter, we have as you know been advancing petty cash, the total amount now approaching $800, and we could appreciate receiving a purchase order against which we can invoice this. We also will need a purchase order covering the slave hoods and deck lids used in shipping. Mr. Kerr is establishing the basis for the pricing of these items. When this can be established, it will also be possible for us to arrive at the premium cost of the hand layup components which should be covered by a separate purchase order. We realize, Ken, that from your standpoint this is a hell of a way to run a railroad; but, in looking at the multitude of problems that were attendant upon moving the Shelby organization from California to Michigan, reorganizing the relationship between Ford and Shelby, bringing A.O. Smith into the picture, had we attempted to, on a formal basis, tie up each lose end as we went along, the program wouldn't be off the ground yet. We have agreed, however, that for the 1969 program we do have time to get the job done in an orderly way. I would suggest that for a starter we have a purchase order from you covering the engineering of the 1969 Shelby GT-350 and GT-500, with the engineering work to ve done in accordance with the table of rates attached, the engineering hours to be subject to our audit, and the cost of the engineering not to exceed $200,000. Despite a lack of letterhead, we believe the source of the letter to be the A. O. Smith Plastics company because it references relationships with Shelby, Ford and DST. We don't know the person's name that drafted the letter. Perhaps if we find more than the first three pages, the author will be revealed. Teaches us us that the decision to shutter Shelby American happened sometime before mid-May 1967, and that didn't leave much time to think. Shelby American's Los Angeles operation was closed just 90 days later (mid-August 1967). We learn that A.O. Smith was actually involved much earlier than the '68 Shelby program. Apparently their involvement dates back to the '67 Shelby program. Based on the term "emergency," this is most likely a reference to creating new molds for the front-end and hood. This would date this line item circa October 1966, when the first batch of cars arrived and the 'launch problems' happened. A definitive reference to the '67 convertible (0139) and the '67 fastback. Most important is this line item taught us that the prototype '68-styled fiberglass components were designed by Ford and fabricated by A.O. Smith in Michigan. 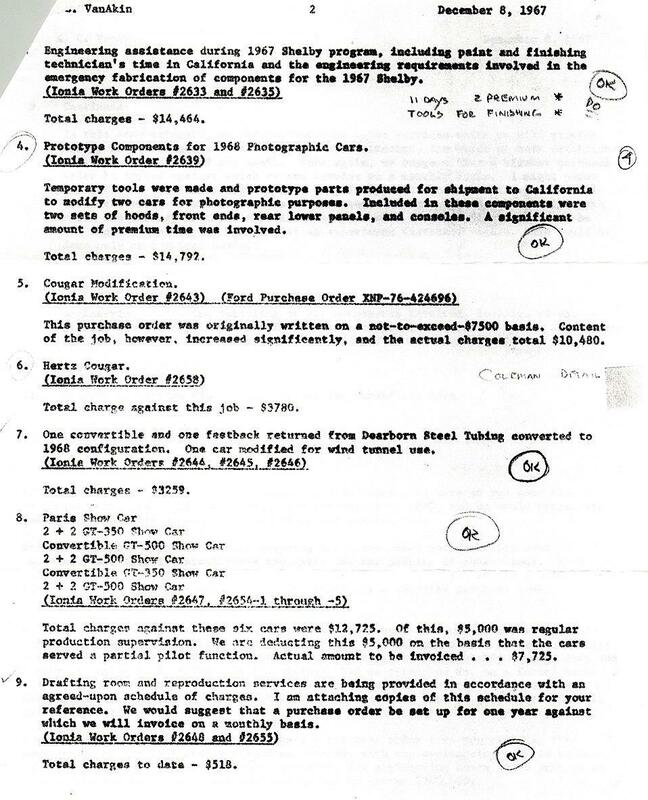 The charge for fabricating two sets of hoods, front-ends, rear [tail light] panels and consoles, was $14,792. Adjusted for inflation from 1967 to 2014, that's $103,473.68 or $51,736.84 per car in today's dollars! Also notice that trunk lids and brake scoops are not listed among the prototype components produced by A.O. Smith. That's because those components didn't change from the '67 fiberglass that was already installed on the two cars. We estimate this work order would have taken place circa March 1967. Hard to understand. The description does not elaborate on the reason behind shipping a convertible and fastback to DST. It mentions conversion to 1968 configuration, but is unclear if this conversion happed at DST or A.O. Smith after the cars were returned from DST. Furthermore, it is unclear if the vehicle "modified for wind tunnel use" was a one of the two cars discussed in the preceding sentence of it was a a third and separate car. The first car on the list is merely referred to as the "Paris Show Car," and based on Peter Disher's excellent detective work, was a Gold G.T 350 fastback. It was shipped to the 54th annual Paris Automobile Show (Le 54 e Salon De l'Automobile), held October 5-15th, 1967. The six cars were most likely some of the '68 pilot cars or the first handful from regular Mustang production. Photos found from the show indicate that the DZUS hood locks still had the same lanyards we saw used in v2 of the styling prototype cars from July 1967. Obvious references to the 1968 Mustang GT/CS (California Special) which went into production in mid-February 1968. 4,118 cars were built, including 251 that were remarketed as the High Country Special in Denver, CO. The lone '67 Coupe, #0131, was the precursor to the GT/CS.